I reviewed one of the first versions of HTTPS Everywhere for the Firefox web browser back in the middle of 2010. 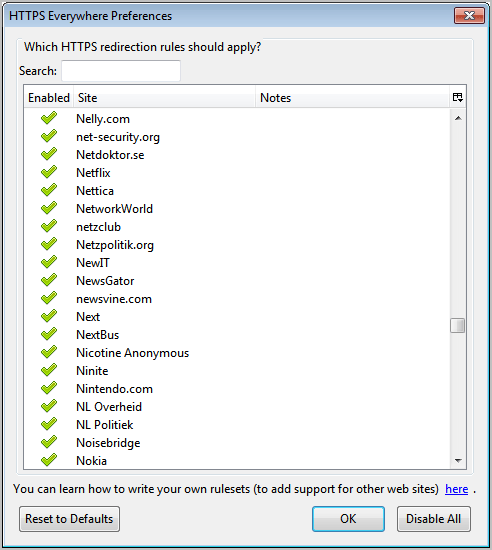 The Firefox extension, which forced https connections to a handful of supported web pages, has come a long way since then. The developers today have announced the release of HTTPS Everywhere 1.0 which includes support for over 1,000 web sites. Among the supported websites are previously supported sites like Google Search, Facebook or Wikipedia, and new services and pages like all WordPress.com blogs, Nintendo, Netflix, Dropbox or the UN website. The extension is useful in situations where websites support both the http and https protocol without a clear distinction between the two protocols, or options to always use https when a user is connecting to the website. HTTPS Everywhere basically ensures that https is always used when connecting to one of the supported properties. Connections that are initiated by the user via http are automatically switched over to https in this case. The add-on options list all supported websites and services. It offers a search to find a specific site and a switch to enable or disable the https redirection. Web users who know their way around regular expressions can even create their own rulesets to add support for websites and services that are not included in the default site listing. New users to HTTPS Everywhere should take a look at the extensive FAQ section at the development site over at EFF.org for detailed information about the add-on and how it protects the user. It may happen that HTTPS Everywhere breaks some part of a website, which can usually be attributed to inconsistent support for HTTPS on those sites. The only option then is to disable the rule and report the problem to the company or individual running the website. HTTPS Everywhere can be installed directly from the EFF website. Cautious users can look at the source code of the project which is also available on the project site.